The Interior Department will rely on financial incentives to meet workforce reduction goals, according to the Trump administration's budget documents. Interior, like all agencies, is currently drafting initial plans to restructure itself and reduce the size of its workforce. The department is planning to eliminate more than 6 percent of its employees in fiscal 2018, totaling more than 4,000 workers. At the direction of the White House Office of Management and Budget, agencies are moving forward under the assumption that the prescribed budget cuts will prevail, although Congress will have final say over funding levels. OMB has tasked agencies to come up with both near and long-term plans to trim their workforces. President Trump proposed a $1.5 billion, or 12 percent, overall cut to Interior’s budget. 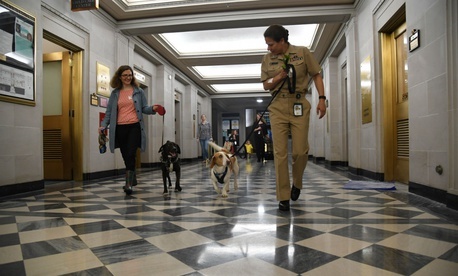 To reach the targeted cuts, Interior said it would “rely on a combination of attrition and separation incentives.” The department left the door open to further action depending on attrition rates and acceptance of the incentives. Interior is the third federal agency to publicly float plans to offer separation incentives to employees to meet the requirements of OMB’s guidance, joining the Environmental Protection Agency and State Department. Agencies can offer up to $25,000 to employees who have worked in the federal government at least three years through a Voluntary Separation Incentive Payment and allow employees not otherwise eligible for retirement benefits to receive them through Voluntary Early Retirement Authority. The Office of Personnel Management must approve all early out and buyout programs. Earlier this month, OPM said it had yet to receive any requests for approval from agencies. The agency has established a team to quickly handle any requests that may come in. The biggest workforce reductions could come at Interior’s Office of the Secretary, which is facing a 16 percent funding cut. Other agencies planning for steep cuts include the Bureau of Land Management (15 percent), U.S. Geological Survey (12 percent), and the Bureau of Indian Affairs (10 percent). Heather Swift, an Interior spokeswoman, said it would have “more details about the reorganization of the department in the coming weeks.” First drafts of those plans are due to OMB by the end of June.